Well-known for his past police dramas such as Tiger Cubs <飛虎>, Joe’s righteousness in every role always leaves a deep impression on the audience. 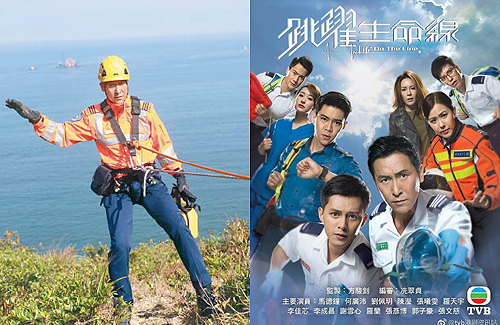 Adding on to the fact that he was previously a police officer before he joined TVB, audiences are thrilled whenever he portrays upright characters in uniforms. For Life on the Line, Joe portrays a paramedic, a character who is disciplined and strict on duty, but is warm-hearted and caring outside the job. When asked if he is tired of acting in disciplined roles, Joe said that paramedics and police wear and provide different uniforms and services, so the role is still fresh. He recalls the most memorable scene was going to save people in a tropical cyclone. They had filmed the whole night while being soaked in water. In the drama, he shares a romantic relationship with Kelly, who is noted for her similar aura and charisma to his old acting partner, Flora Chan (陳慧珊). Though, this is the first time they acted together, there is great chemistry between them. Joe praised, “She is smart and has her own distinct aura.” Kelly is also happy with comments on her similarity to Flora and the acting opportunity given to her, despite feeling stressed out because she has so many scenes. She commented that she flew to the United States to learn how to drive a motorcycle. Matthew and Moon are another romantic pair, who start off as enemies before turning to lovers. Similiar to Kelly, Moon worked hard to learn and drive a motorcycle. She injured herself during the process, but it was worth it to see herself on a motorcycle onscreen. Joey is also given the biggest role to-date in his career thus far. Cherishing this opportunity, he restricted his diet and lost twenty pounds within four months. Earlier he was worried because Joe has such a strong leader aura, but after losing fat, he now feels more mature to act as Joe’s supervisor. To better prepare for his role, Joey had gone with Matthew to attend emergency service training classes. Life on the Life is set to air on October 8, 2018. Joe Ma must not be getting a lot of work outside of TVB to keep returning for these garbage projects.